I've said before that the bugs in my parents' back yard seemed especially hungry over the Christmas break. Above you see more evidence to this fact. 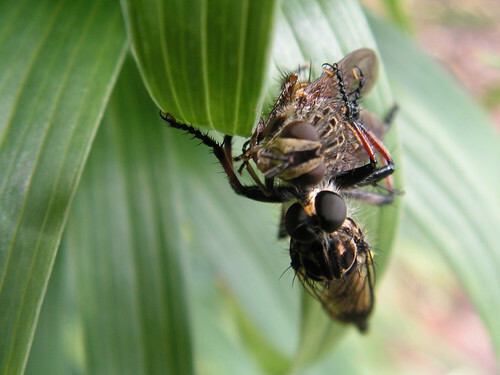 In the lower half of the photo is a robber fly and above is its meal, a blowfly of some sort. I've never seen live robber flies in Dunedin (though there is a dead one here) but the species captured above seems to be reasonably common in the Wairarapa. The first time I spotted one of them I struggled as to where to place it among the insects. The robber flies have long slender bodies and large rounded eyes which misled me into thinking that first sighting might be a small dragonfly. The real taxonomic position of the robber flies is spelt out in bright yellow in the next photo. That bright yellow structur under the main wing is a haltere. Most insects have two sets of wings and we can tell quite a lot about where a given species fits in the insect scheme based on how it uses those two. Dragonflies and damselflies use both for flying, in beetles the forewings are "sclerotised" into a rigid case that protects the flight wings and the "true flies" ( order Diptera) have turned thier hind-wings into halteres - greatly reduced wings which act as gyroscopes stabilising the flies' flight and allowing them to perform aerobatic tricks. The robber flies from the extremely widespread and speciose family dipteran family Asilidae which includes a staggering 7 000 described species, meaning there are rather more robber fly species in the world than there are mammalian ones. The features that led me to mistake that first robber fly that I saw for a dragonfly are likely the result of convergent evolution - dragonflies and robber flies are both predators that specialize in taking other insects on the wing. 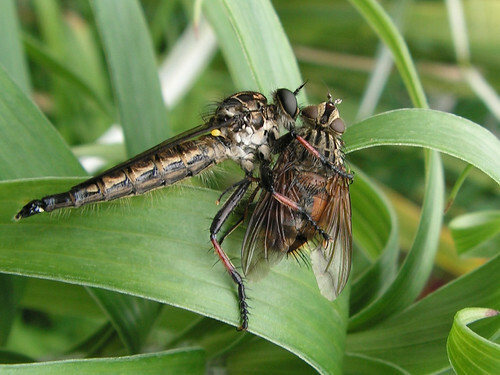 The robber flies differ from odonates in having piercing mouth-parts which they use to inject first a neurotoxin then digestive enzymes into their prey. 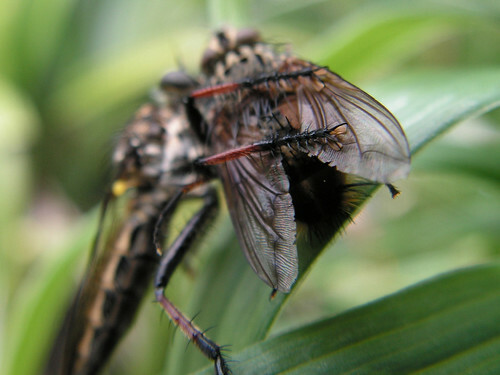 The blowfly in the photos in this post is paralysed and its tissues are in the process of being liquified and sucked through the robber flies mouth parts. But ever before the neurotoxin entered the blowfly's body it was done for, the robber fly's strong "raptorial" legs are covered in sharp spikes and end in claws that offer little hope for escape once a catch is made. Excellent photos! What kind of camera do you use? And why do you think the haltere is such a bright yellow? 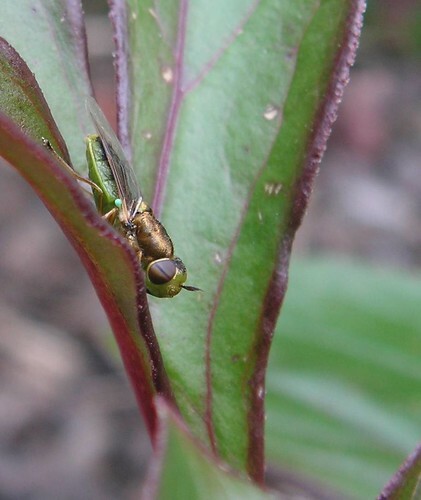 I have no idea why the halteres are so bright, I have some photos of a native soldier fly with even brighter green halteres. But I don't know why they're that bright either. I like a camera with a good macro mode. I had a Pentax Optio S for many years which did an amazing job (for the cost) but it died recently. It would be interesting to see if it was a sexual selection thing by painting some flies' halteres dull. I can't think of any other benefit to having bright protrusions. Although perhaps they're good for frightening predators off?